By GreenEyedLillies on October 29th, 2008 . Filed under: Holidays, Kitchen, Party Items . Treat your little “cupcake” sweetly with this especially made for her pink rimmed cupcake plate with drops of chocolate brown. 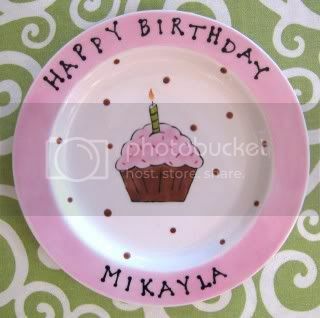 The “Happy Birthday” plate also makes a fabulous gift for baby showers or birthdays. Each plate is a hand-painted Aedriel Original’s with the child’s name. Plate featured is 8.5” across. Larger plates are available. Since all ceramics are hand-painted it is characteristic to notice variations in color and art, including brush-strokes and details of the ceramics. This is intentional and adds to the unique quality of each item. All pieces are food and dishwasher safe. To insure the longevity of all hand painted ceramics hand washing is recommended. As a serious cupcake lover, I have to say this is the cutest plate ever! I checked out her website and found some other adorable things I can’t live without! :) Thank you for posting this site….now I am really hungry for a strawberry cupcake!